Deputy Jacob Kapanui and other unnamed jail guards at the Allegan County Jail brutally beat Aaron Henderson after he was arrested for disorderly conduct. Now the taxpayers in Michigan will be paying Henderson $300,000 to settle the lawsuit he brought against them as a result. As should be expected, neither Deputy Kapanui, nor any of the Good Cops who stood by while he repeatedly kneed Henderson in the head, will be charged with any crime despite the settlement. 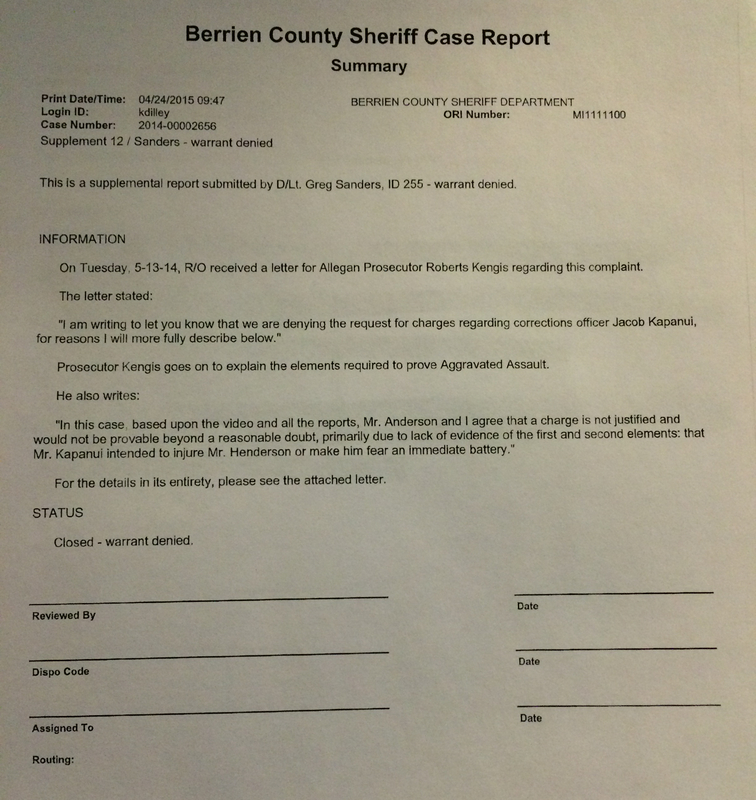 In the lawsuit, Henderson said on Feb. 20, 2015, an Allegan County deputy kneed him in the head, causing him to hit a wall and break several facial bones. He said he didn’t get medical care for hours. Henderson was seeking damages in excess of $75,000. The Berrien County Sheriff Office (sic), which was in charge of the investigation, said Deputy Jacob Kapanui gave a “knee strike to the head area” while trying to remove Henderson’s clothes. According to the case report, Kapanui used his knee to keep Henderson’s head on the bench because Henderson was moving it wildly and banging it into the wall. While the county admitted Kapanui used a restraint that wasn’t taught by the sheriff’s department, the county prosecutor refused to file aggravated assault charges against Kapanui. Prosecutor Fred Anderson told 24 Hour News 8 his office was unable to prove intent beyond a reasonable doubt in this case. When you watch that video, you can pretty clearly see that Kapanui and the other deputies are obviously concerned about Henderson hurting himself and those knees to the head that broke bones in his face are love taps meant to prevent him from banging his own head into the wall.